Basically, the game asks a lot of you, and demands that you pay close attention to every decision you make. While that makes for a steep learning curve, requiring deep thought is hardly the worst sin a strategy game can commit. 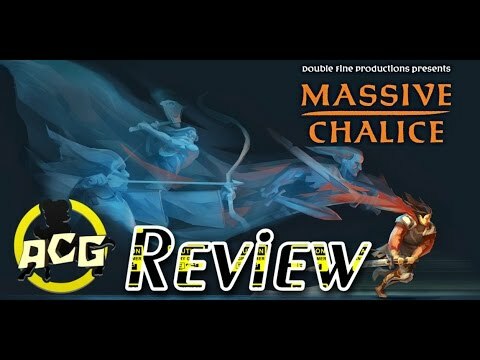 Slyly funny, satisfyingly deep and yet slick and simple to play, Massive Chalice is a huge return to form for a studio that is overdue a comeback. Massive Chalice's aggressive tactical combat would be stronger without so many opportunities to lose due to bad luck. ​Double Fine's Massive Chalice takes XCOM's DNA in a fresh direction, but doesn't exceed it. A strategy role-player that is filled with clever ideas and inspires great empathy with your characters, even if the battle system is a few steps behind XCOM. Massive Chalice can create hilarious moments of eugenics disasters, but other elements leave a lot to be desired. A smart, fun exploration of turn-based tactics in a fantasy setting. Massive Chalice's generational loop makes for a strong core, and elements like the hybrid classes lend it some much-needed depth. However, it doesn't do a great job of tracking the history of your heroes, and it's ultimately lacking in elements like diverse character art and base classes. Still, there's the foundation for a phenomenal strategy game here if Double Fine is willing to build on it. As it is, though, it makes for a diverting few hours, and a welcome change of pace from XCOM. I felt like middle management making the same position appointments that a computer could make more quickly and all I got for my click click clicking was combat with bigger numbers on the same handful of stages. There is some payoff with the bloodline idea at the end, but it is not worth the rote meat grinder to get there. Between the bloodlines, research, and combat, Massive Chalice tosses a ton to micromanage, and it can feel overwhelming. But it all builds up to a spectacular ending that makes it worthwhile and satisfying. Massive Chalice really has a unique and interesting premise and even with the lackluster combat it's a lot of fun to play. The management of bloodlines and Keeps, the necessity to keep breeding different types of units to keep your army balanced, and a wide array of power-ups you can research make each playthrough feel different. An isometric tactical fantasy that marries XCOM's strategy with Game of Thrones' epic death-toll. There are many good things within Massive Chalice, but they're frustratingly kept at arm's length from me. Double Fine's unusual, generation-themed turn-based strategy epic forces players to learn to let go of their favourite champions. If you're a fan of strategy games, there's a lot to enjoy in Massive Chalice. The combat demands you play smartly, which doesn't always mean conservatively. It's visually appealing and carries with it the charm that all Double Fine games have been known for. It's also not as difficult as other similar strategy titles which can make it more accessible, though the menus and new concepts are still rather daunting if you aren't a genre veteran. The Bloodline system never fully achieves what it set out to do, which, as its selling point, is its biggest disappointment. While it lacks the depth it initially promises, the system still plays a crucial role in the outcome of your centuries long war. Decisions you make early on will impact the tide of war decades later. It's just too bad all those people growing up under your command ultimately die without their story ever really being told. This is by no means a must-play if you aren't a strategy fan, but those who do frequent the genre should consider Massive Chalice a flawed but worthwhile addition to their Keep. Massive Chalice is an interesting twist on the genre, though it does sort of feel like more could have been done to differentiate it. The game's style is good, and the basic structure is engaging and challenging. Combat could be a little more tactical, but overall it's a solid game that provides a great outlet for any turn-based craving you might have. Massive Chalice's personality and ingenuity ultimately win out over its shortcomings, and it's certainly worth a try for strategy fans who don't want anything too ponderous or serious. But its cup does not, as they say, runneth over. Between the far-reaching scale, the slick and intuitive combat, and the fun of raising heroes through the years, MASSIVE CHALICE brings a whole lot to the table. While each piece may not be strong enough to stand in its genre alone, the combination and way that each plays into the other creates a phenomenally fun experience. Functional, but often uninspired, Massive Chalice may please strategy enthusiasts but will likely bore anyone else.